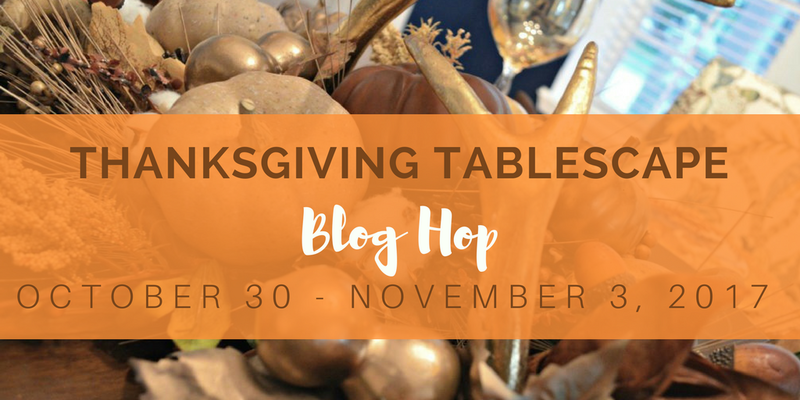 Although Thanksgiving is behind us here in Canada (Oct 9th this year), I've teamed up with a group of talented bloggers to share some tablescape ideas for this special holiday which is coming up at the end of November in the States. 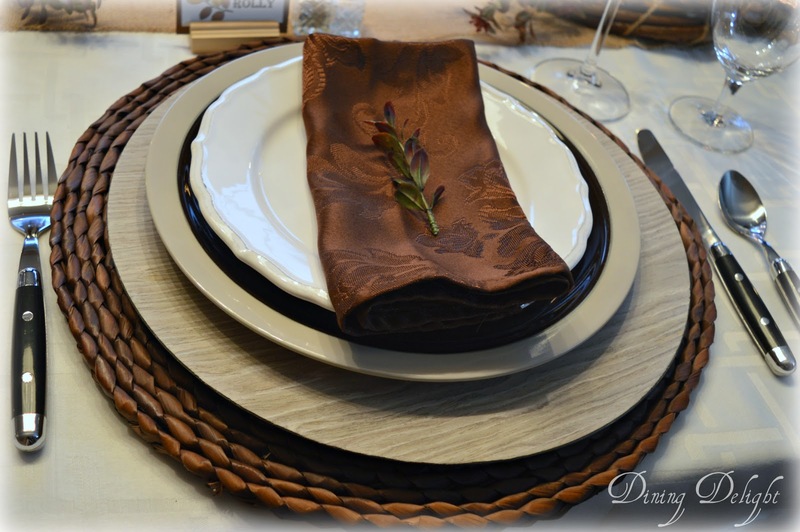 This Thanksgiving tablescape Blog Hop is hosted by Chloe at Celebrate & Decorate and no doubt, the Thanksgiving tablescapes linked below will provide inspiration for any fall dinner you may be planning. 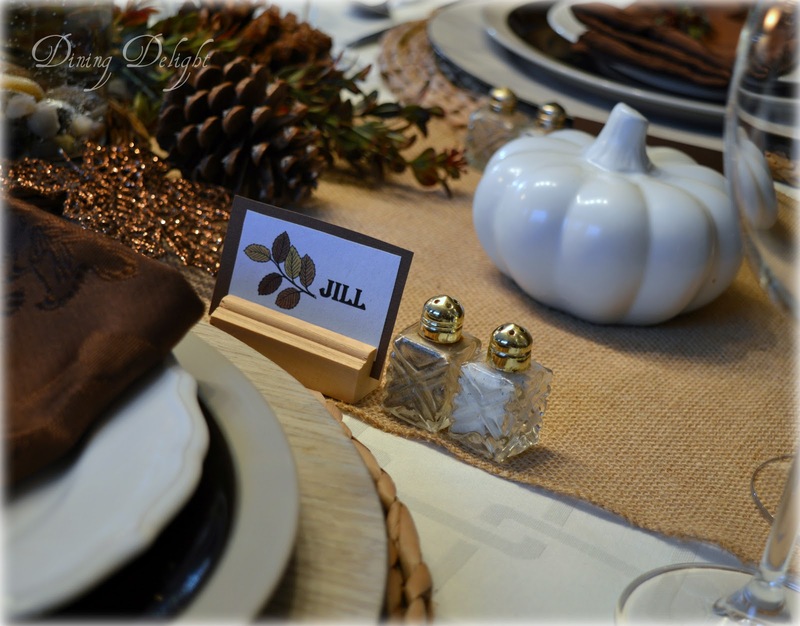 And a fall dinner party is exactly what I set this tablescape for a couple weeks back. I think it would work equally well for Thanksgiving. ... the table is vibrant with ambiance created by the use of cylinder vases as candleholders. 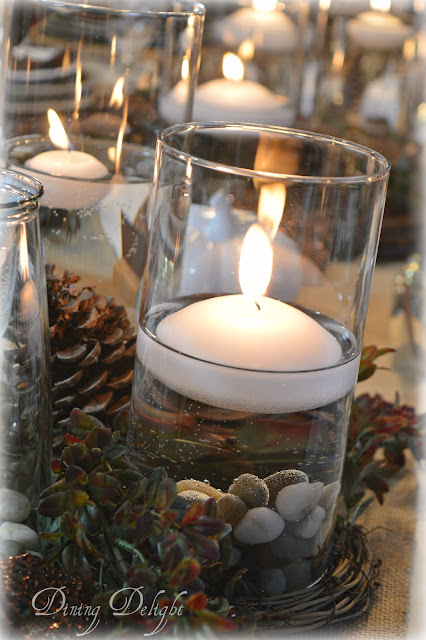 Floating candles were placed on water with a few pebbles added to the bottom of the vase. 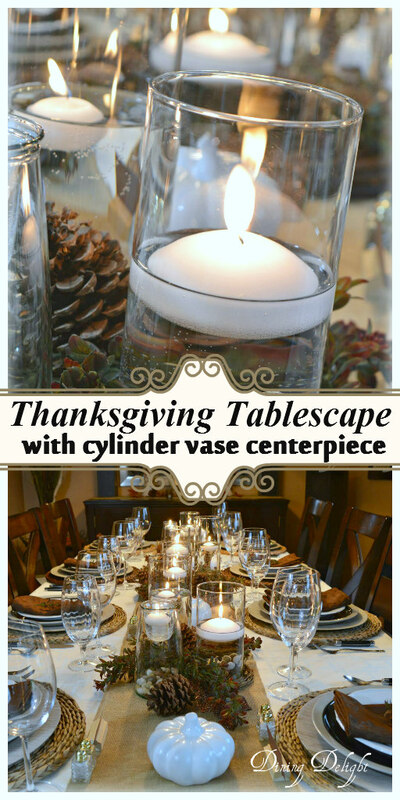 A trio of the cylinder vases were set inside a grapevine wreath. Pine cones and faux fall greenery filled the spaces in the wreath. Sparkly leaves cut from branches (Dollar Store) added a festive touch. If you vary the water levels in the vases, you will get a more pleasing look. I actually like the look of the bubbles that inevitably occur as the water sits. 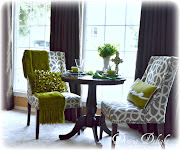 Three groupings of three vases were placed down the length of the table on a burlap runner. 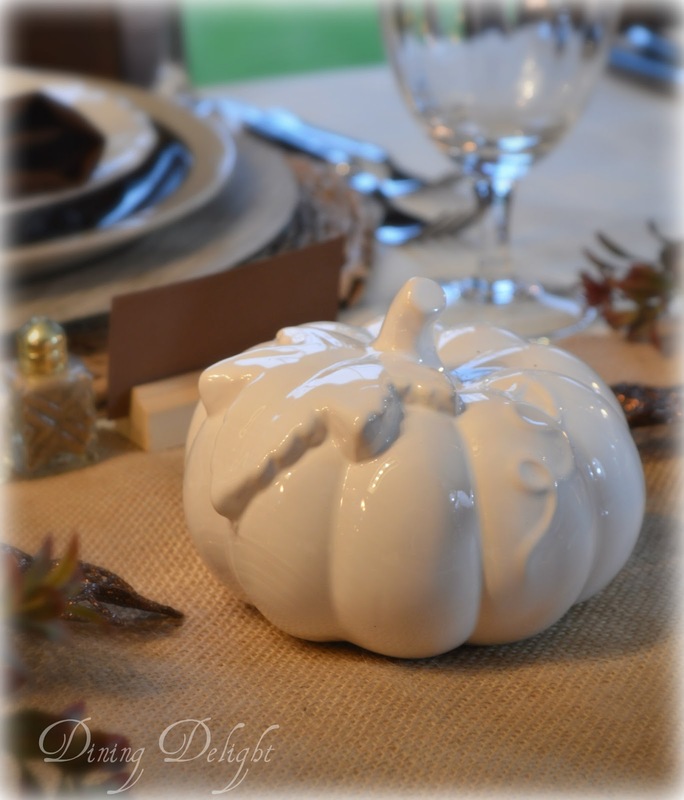 Ceramic white pumpkins sit in between each grouping. 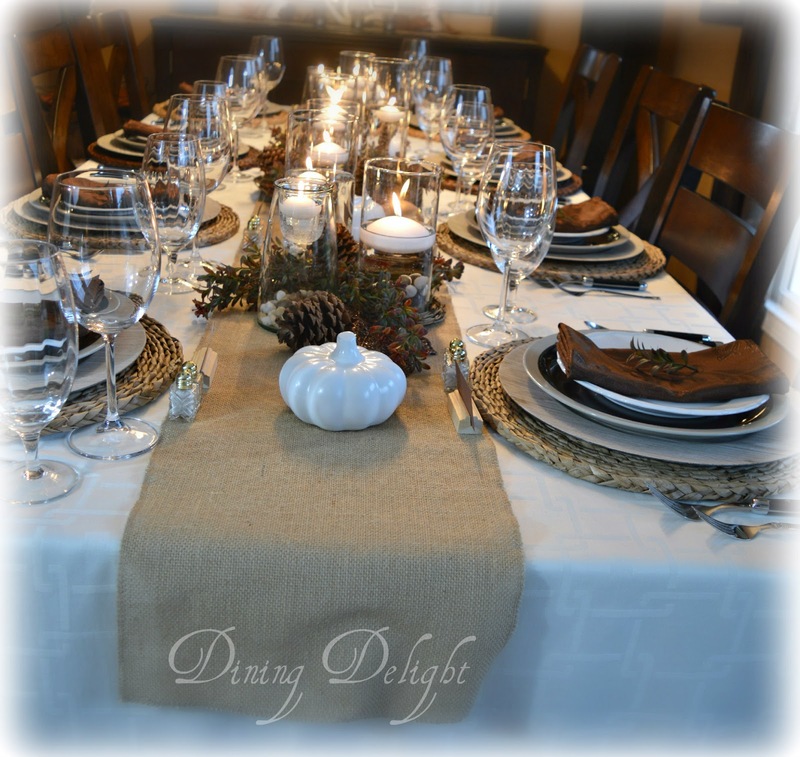 Place settings were arranged in tones of white and brown. 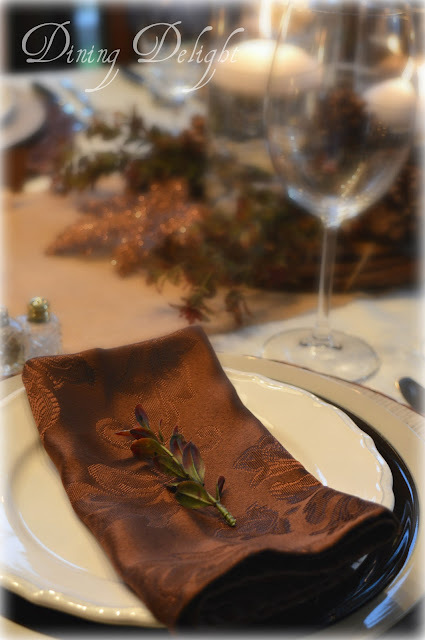 A simple napkin fold with a small embellishment of greenery. New black-handled flatware from HomeSense coordinated with the colours. I made some appropriately themed placecards and set them in these wooden holders. 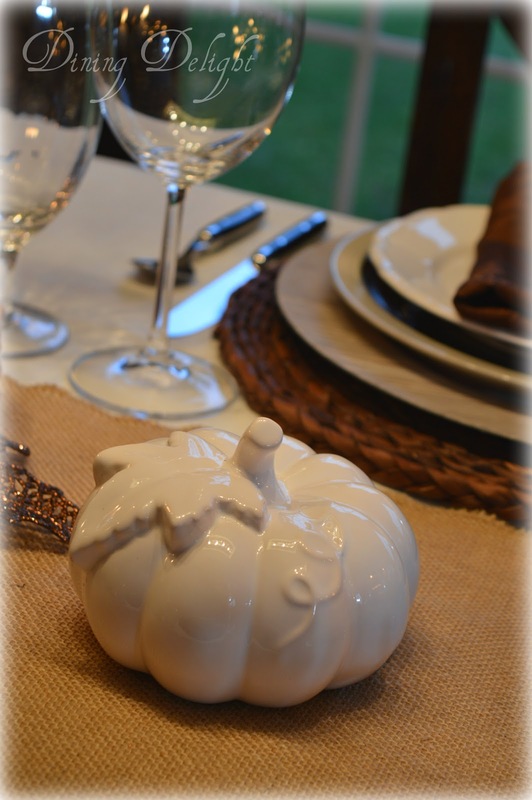 Individual salt & pepper shakers are readily available at each place setting. 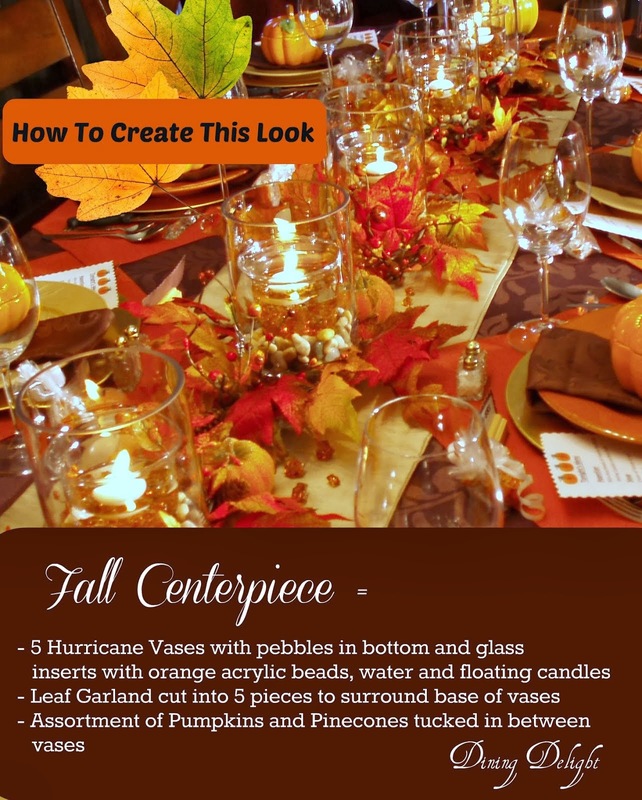 And there you have a simple-easy-to-put-together tablescape for Thanksgiving or fall dinner party. 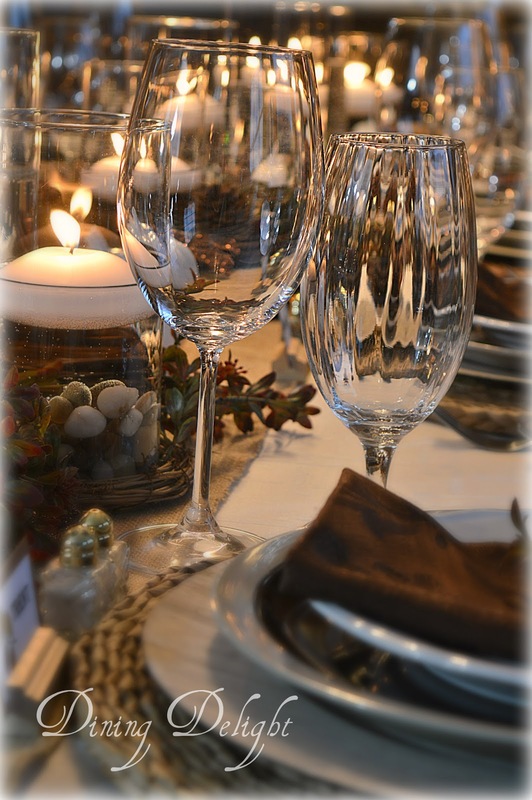 ...help create a festive atmosphere for any special occasion gathering. 4. 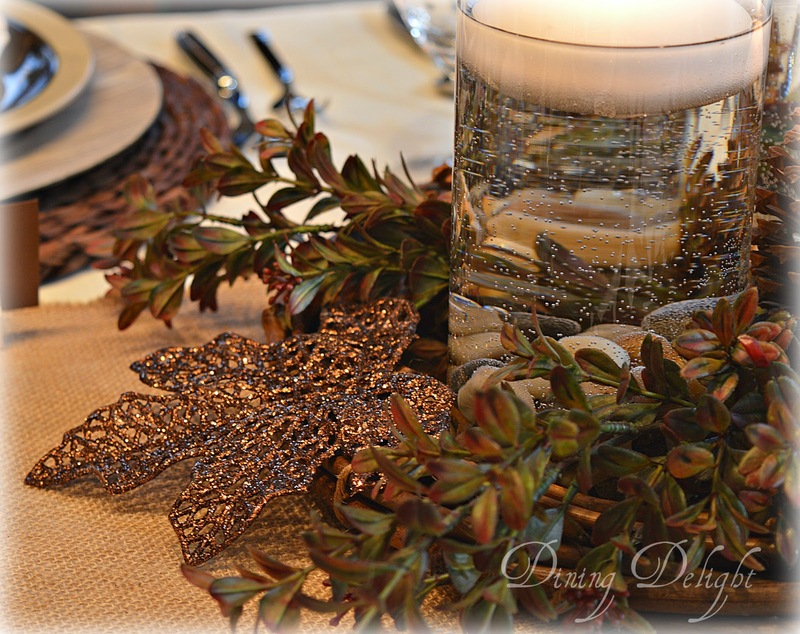 Arrange pine cones, greenery and glitter leaves around vases. 5. 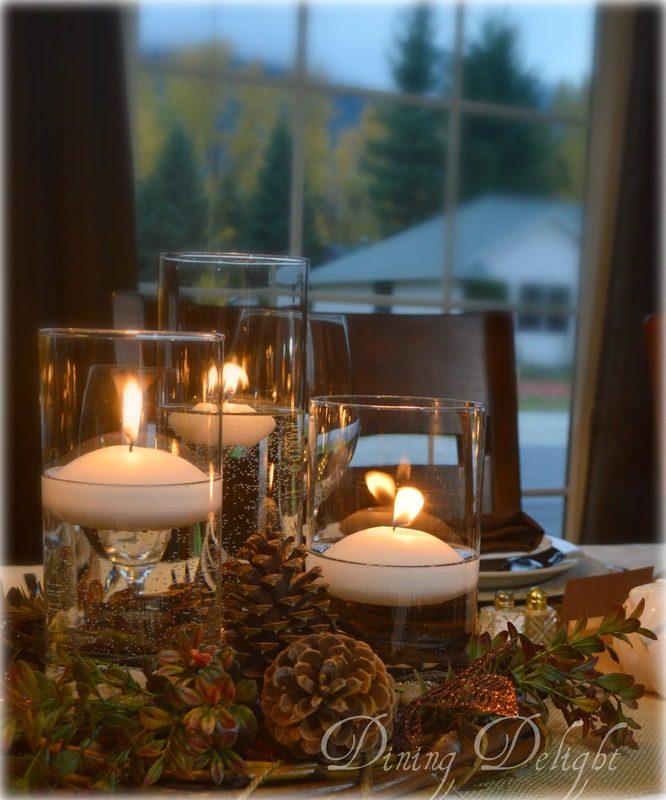 Light candles and enjoy the ambiance! You will find many other ideas for setting just the kind of table you had in mind for your Thanksgiving meal or fall dinner party at the terrific blogs linked below. Lovely! 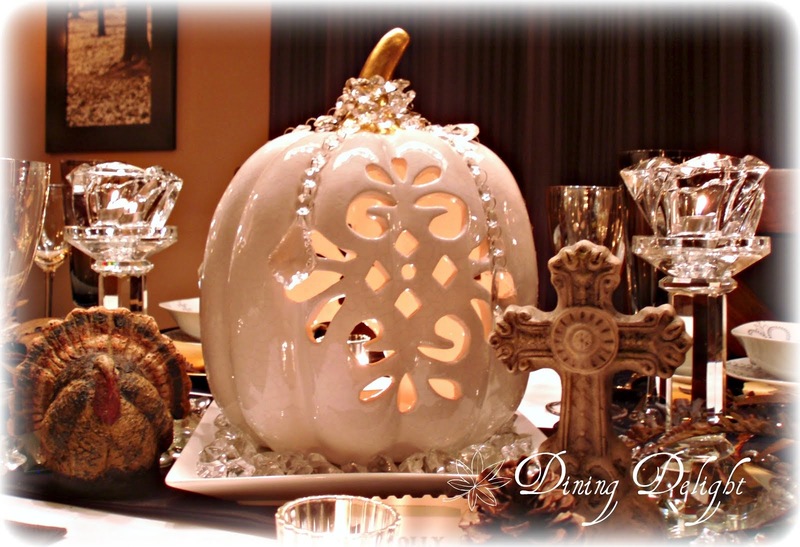 Ceramic pumpkins are beautiful and floating candles are sweet and romantic. 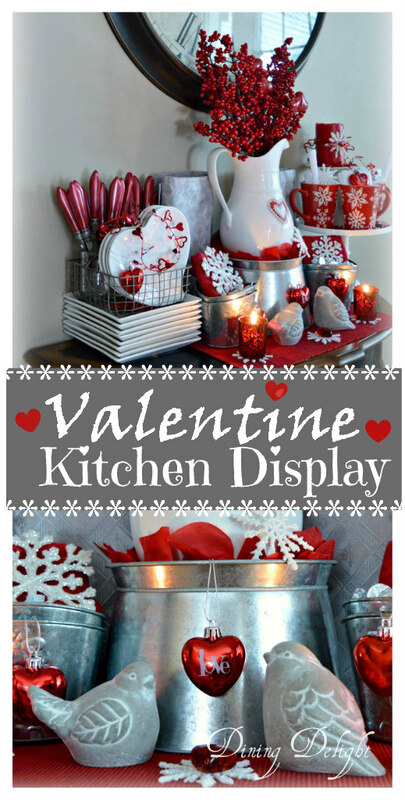 Lori, the your blog name is so apropos - I just love coming over to see what dining delight you'll be presenting. This is beautiful, very earthy, and your floating candles in hurricanes are the stars. 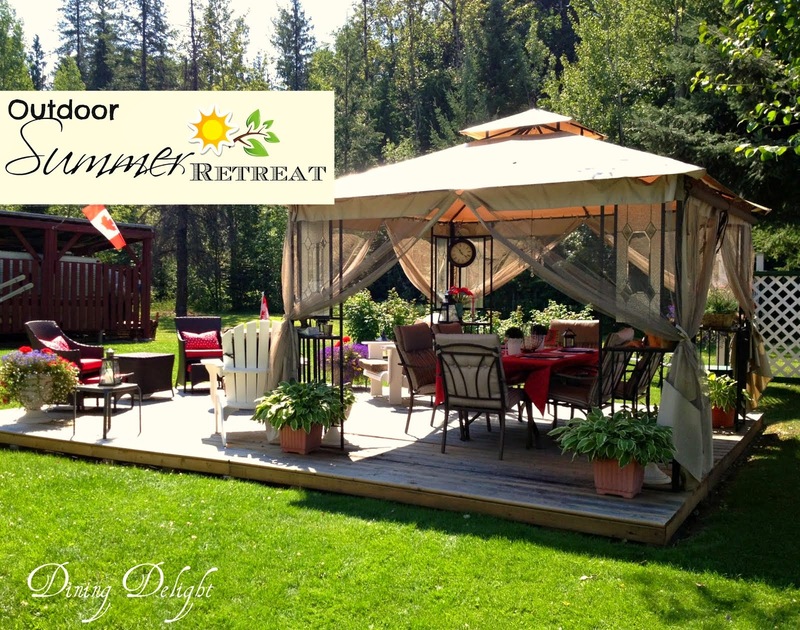 It's a pleasure having your company this week on the blog hop. Happy November! Lori, You give the most delightful dinner parties. You have created a vibrant ambience for sure. 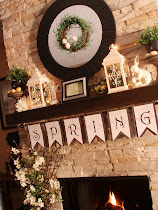 So clever to use three wreaths down the runner full of texture and light. The layering and myriad of textures are very artistically designed. Thanks for the, what you need, and what you do lists. Very creative! 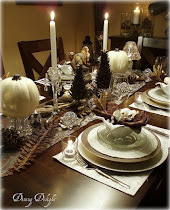 Gorgeous, Lori, the pine cones add such a rustic autumn feel to your table and the chargers pick that up nicely. The neutral tones are lovely. There is so much warmth in your table, such a nice touch to add the bit of greenery to the simple napkin fold. Lori, your table gives off such an awesome glow of warmth inviting everyone to sit and enjoy. 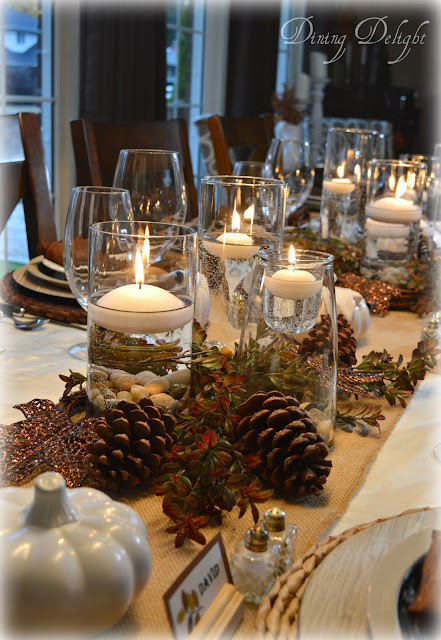 I love your cylinder vase candle centerpieces, and the pine cones and greenery you arrange with them. That little bit of sparkle on the leaves adds a special spark. 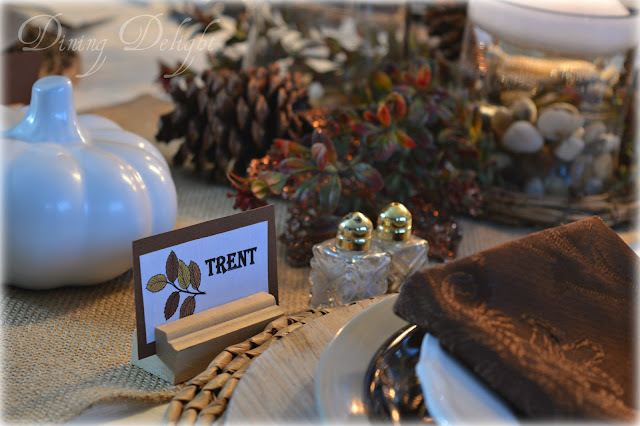 The place cards are perfect and the little sprig of greenery atop your napkin are those special touches that make this table so beautiful. 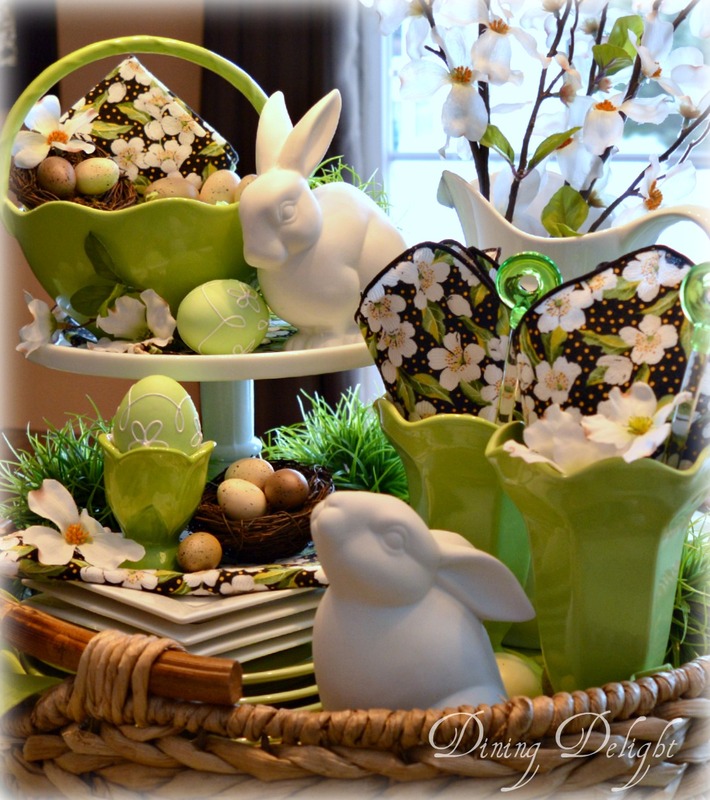 I am happy to be blog hopping with you! Lori, I love how simply elegant your glass cylinders look with the floating candles. It's the perfect ambience for your dinner. 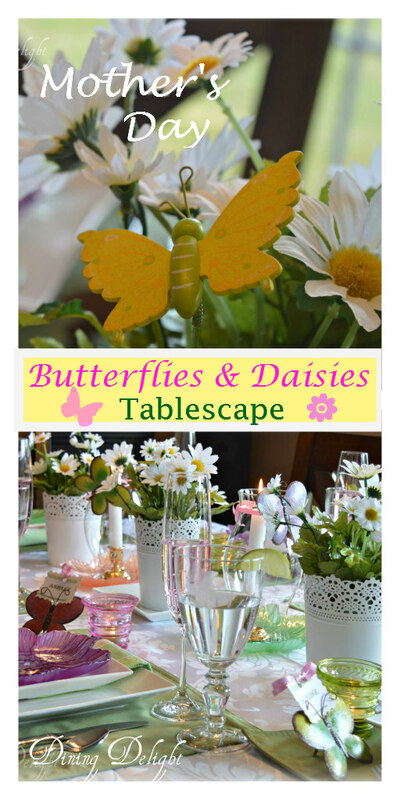 I'm so glad to be part of this blog hop and to meet many bloggers, some who are new to me. 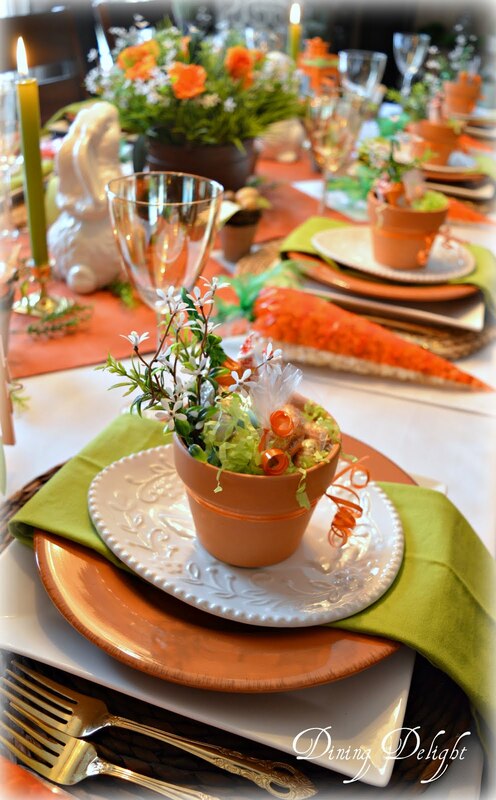 Lori, you always present beautiful tablescapes and this is no exception! 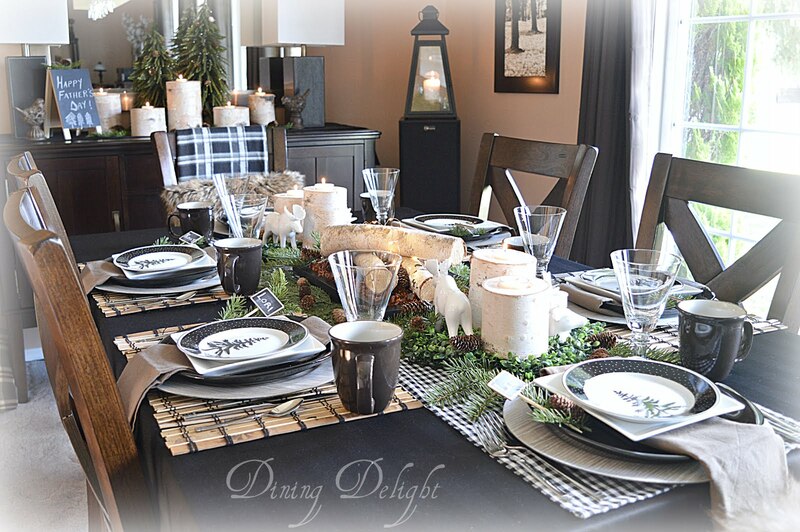 The use of the cylinders with the floating candles and your earthy elements is rustic and glam! 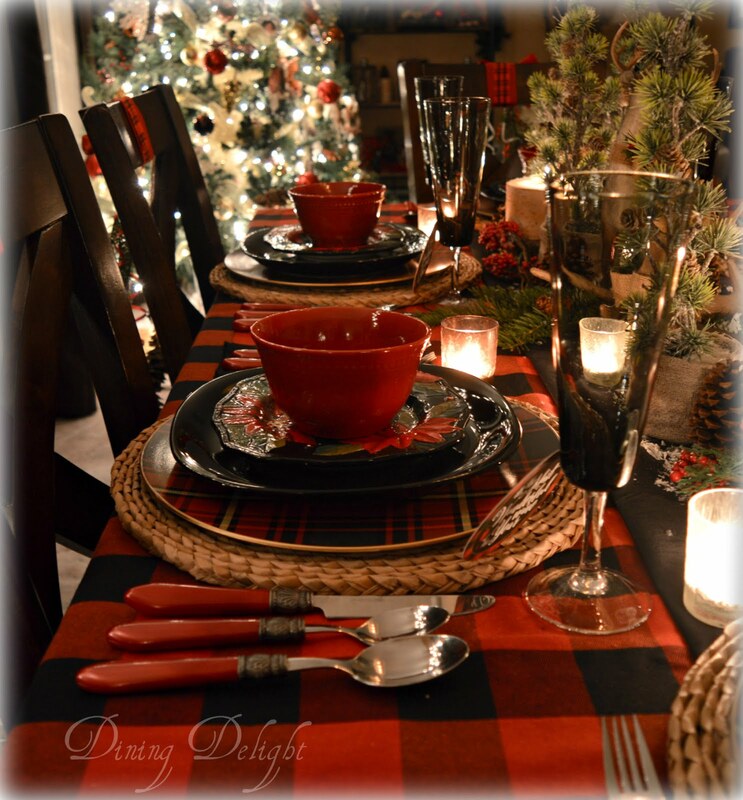 I love the texture and warmth that your table provides! 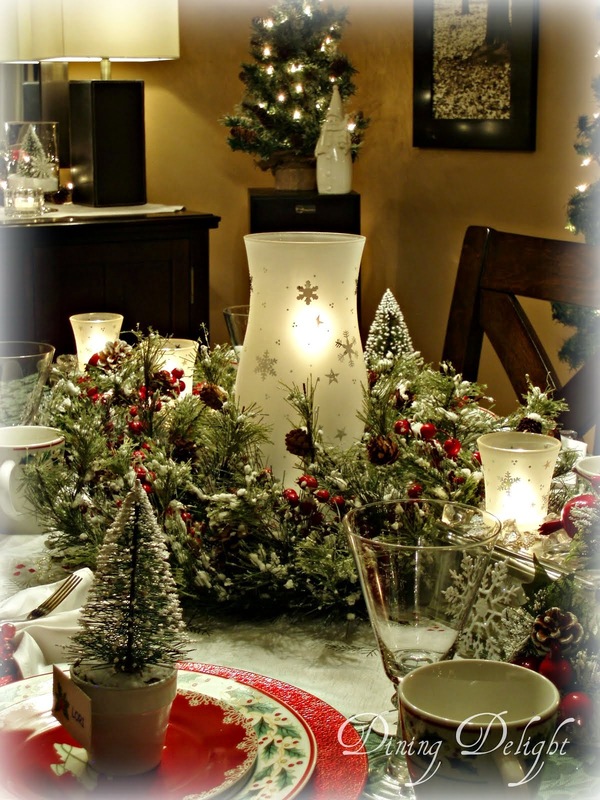 What a cozy ambiance to sit and enjoy at your gorgeous table! I always enjoy blog hopping with you! 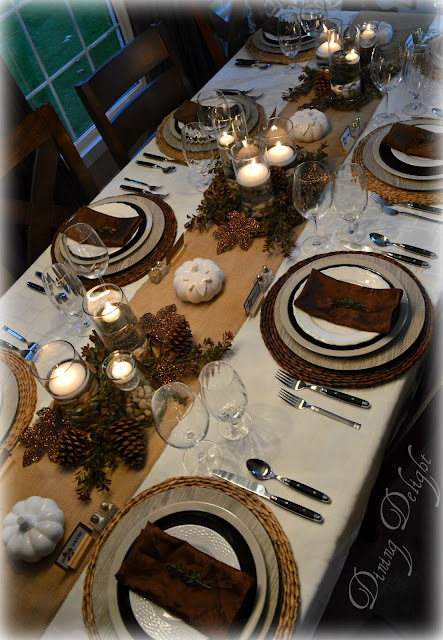 Thank you for sharing your beautiful table. 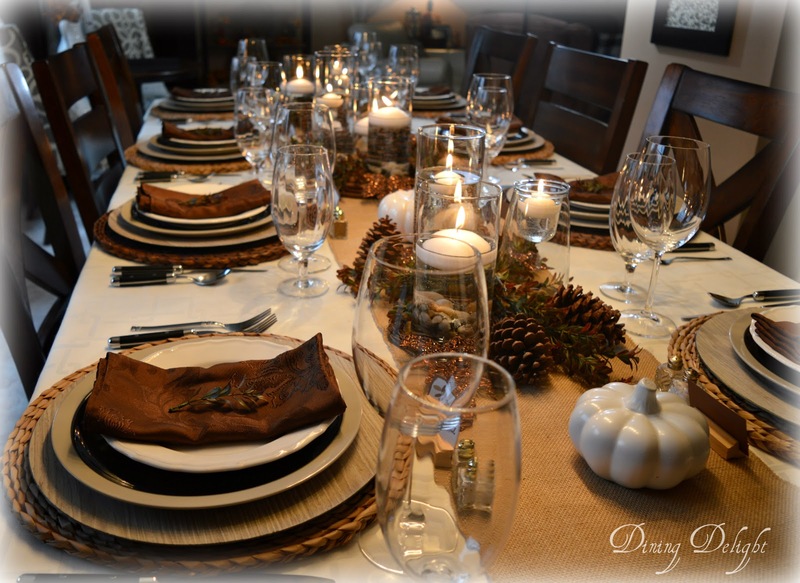 It looks perfect and ready for family and great food! Happy holidays! 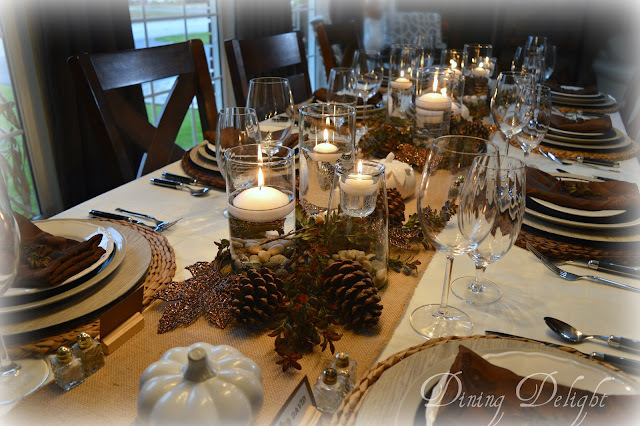 Lori, such a lovely tablescape. The grouping of cylinders is quite striking. 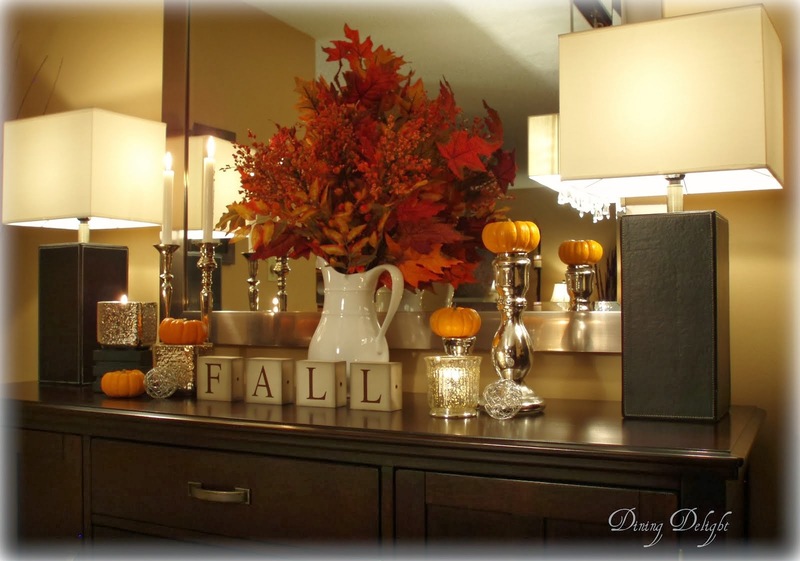 Love the floating candles. 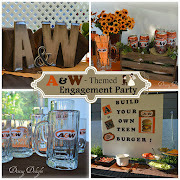 The way you personalized everything shows how much you care about your guests. 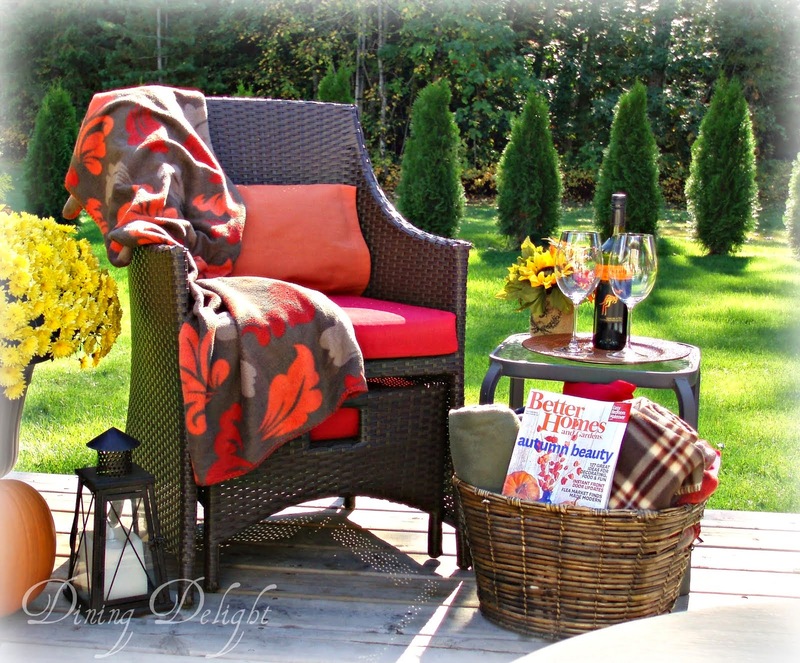 Truly a fun blog hop. While the colours may be understated (which I love by the way), your use of textural elements really bring life to the table. 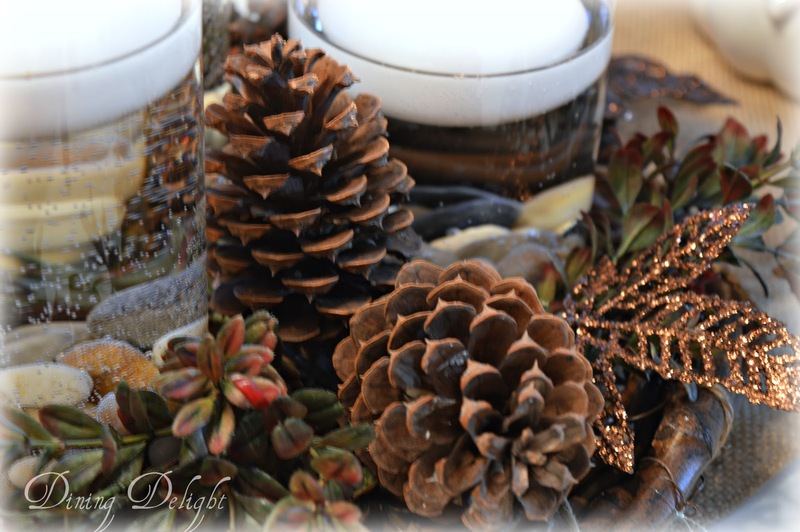 The pinecones, grapevine wreaths and candles floating in water really draw the eye. 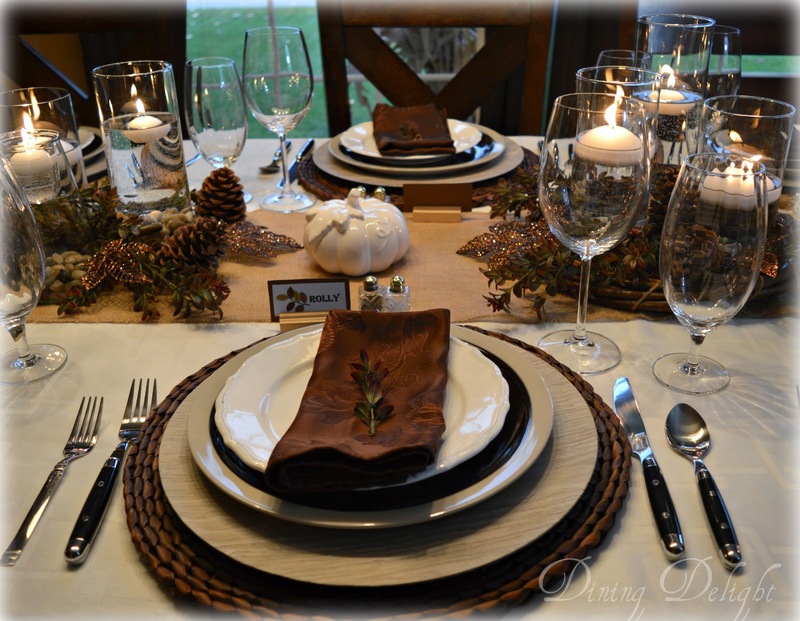 I love the layered place settings. Very warm and inviting table indeed! As a fellow Canadian, the only thing I miss about not sharing Thanksgiving day with our US friends, is the fact that I am usually at work and don't get to see the Macy's Thanksgiving Day Parade! Group the vases in sets of three with different water levels is such a good idea, thank you. 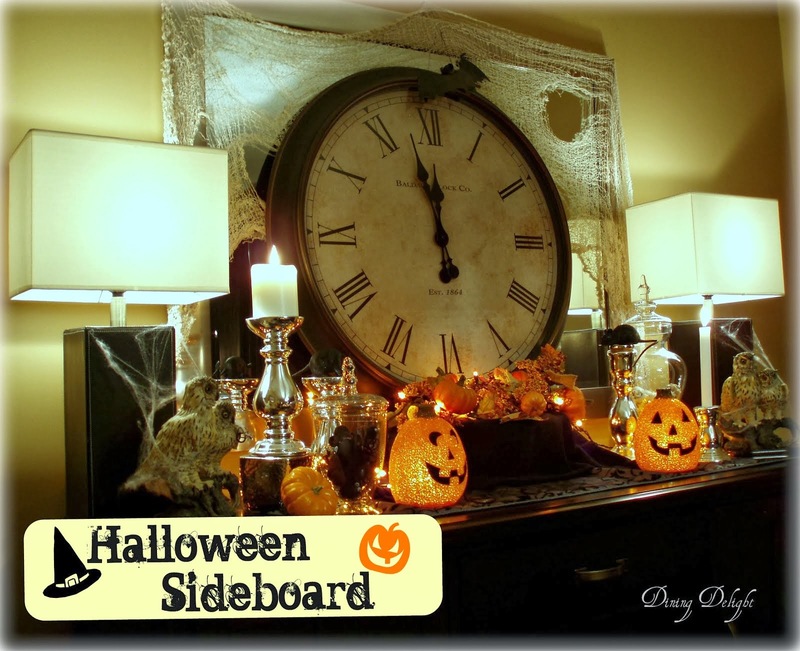 This table is so relaxing and the soft lighting creates an inviting ambiance. 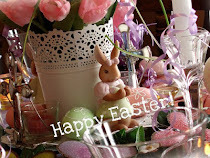 I've enjoyed blog hopping with you and have a peaceful weekend. 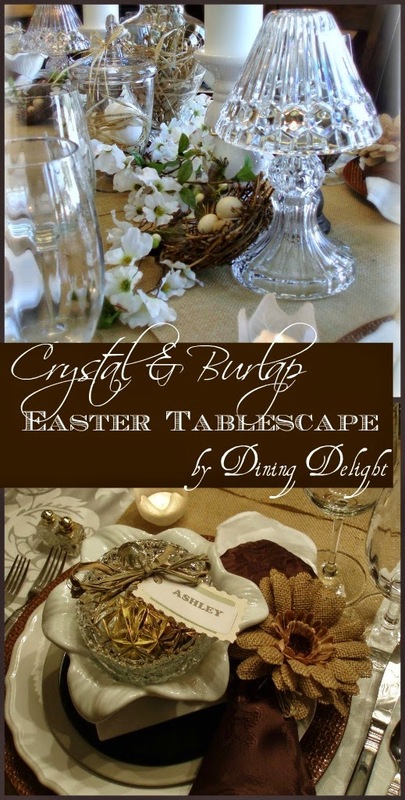 You definitely have the gift of creating beautiful tablescapes. 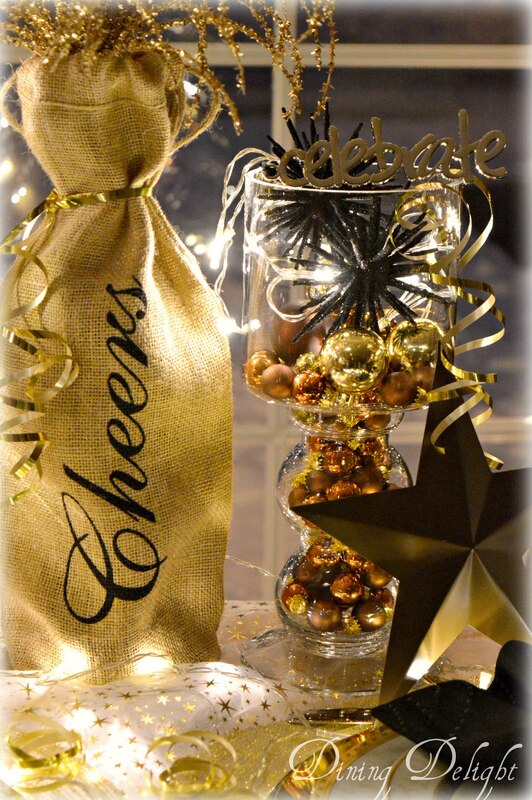 I love the beautiful brown color paired with the glass! Beautiful! 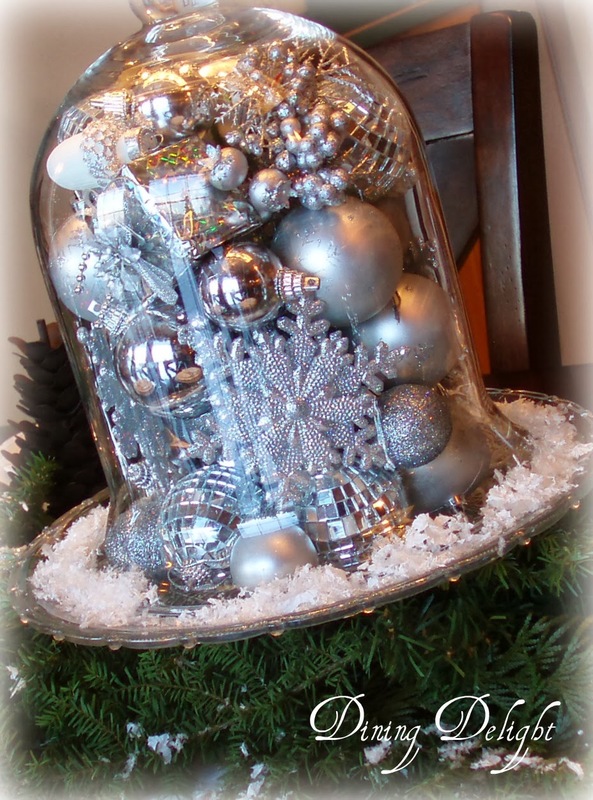 Perfect any time of the season or even for Christmas with a bit more added. Nicely done! So pretty Lori, the dark brown and white is gorgeous for the entire winter season, especially in Canada where you have cold winters. 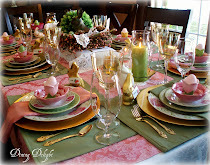 You always add so many wonderful details to your vignettes and tablescapes, it is such a joy to pour over every photo! You have really created such a warm look for this tablescape, and the glow of the candlelight must look gorgeous in your dinning room. 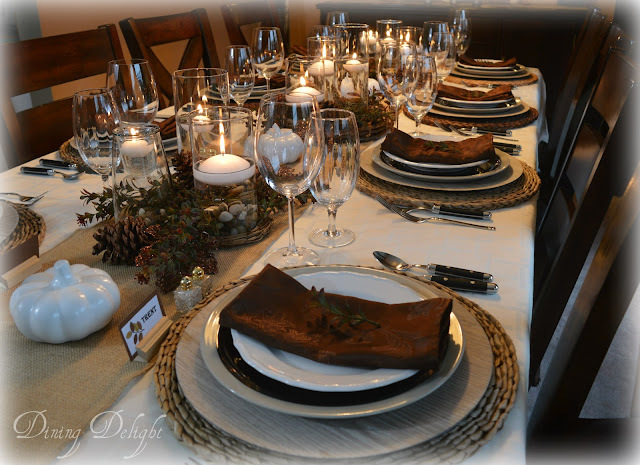 This was such a generous tablescape for a large party, that was gorgeous from one end to the other. 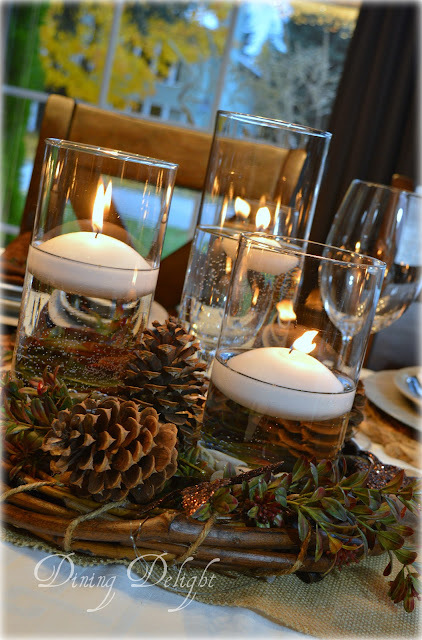 I like the details of the natural stones in the candle vases and the greenery that adorned the napkins. 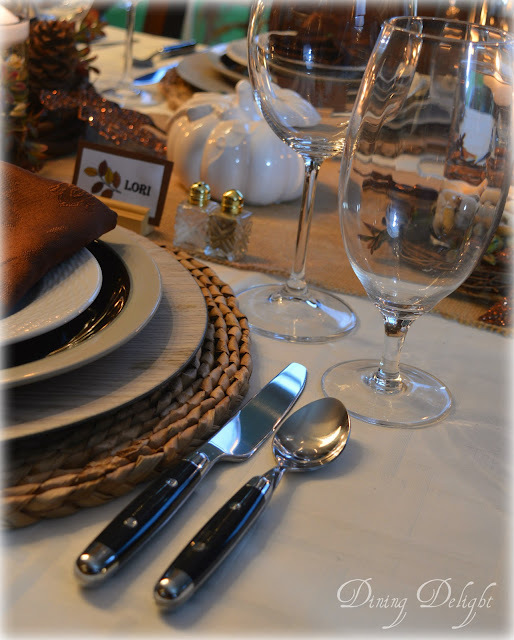 Your new flatware also stood out in a very sophisticated way, great job! 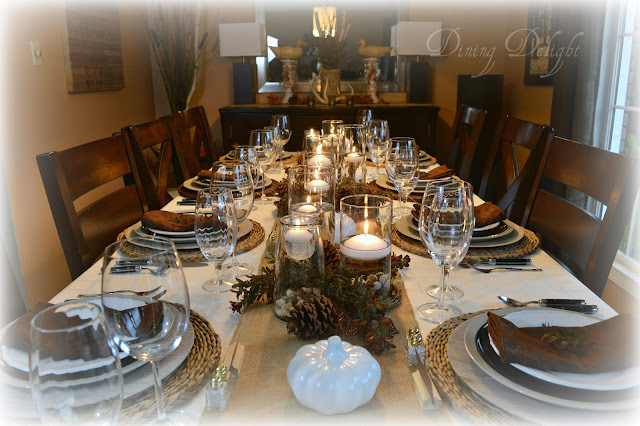 I am thankful that you are part of my tablescape blogging tribe. 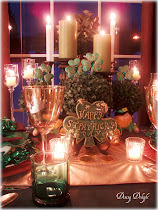 Lori, I LOVE the floating candles. 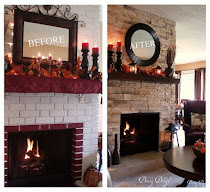 What a great idea to add color, texture, ambiance and mood. Varying the water is a super idea and thanks for the step by step. 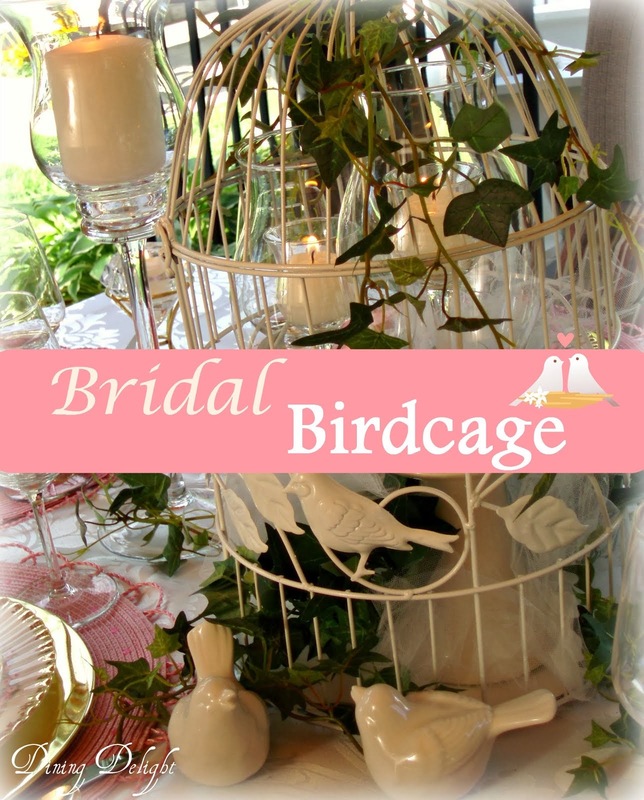 A lovely elegant setting all around. 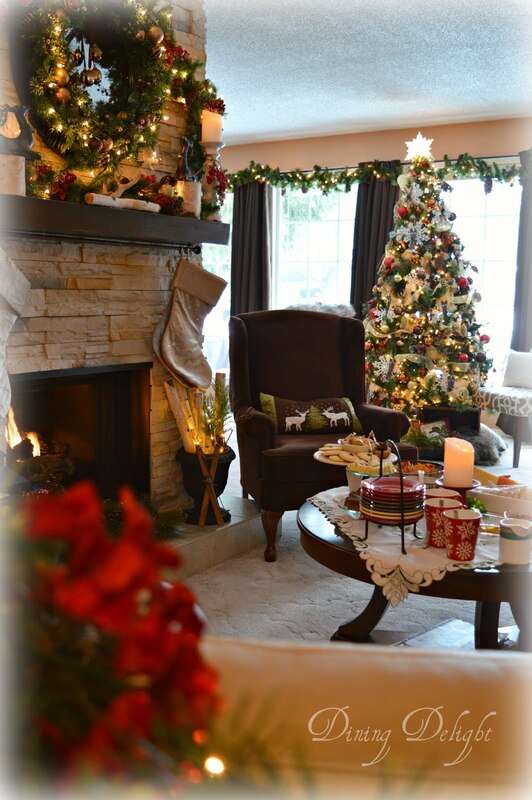 Dazzling and cozy, with a magical ambiance. 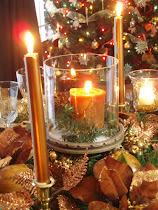 I am just wild about your candle groupings, and I will remember your clever tip. 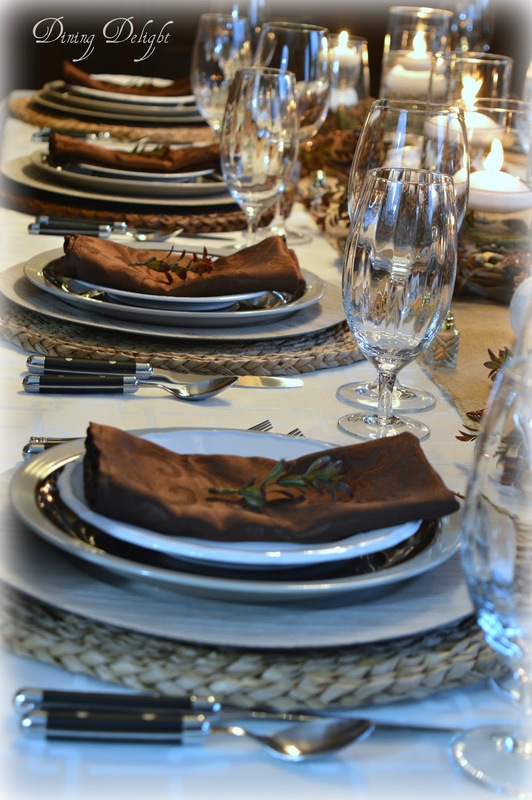 It is always a pleasure to see your beautiful tables. Here, your artistry is in fine form as you mix textures and hues with a masterful touch. Enjoyed our virtual dinner! 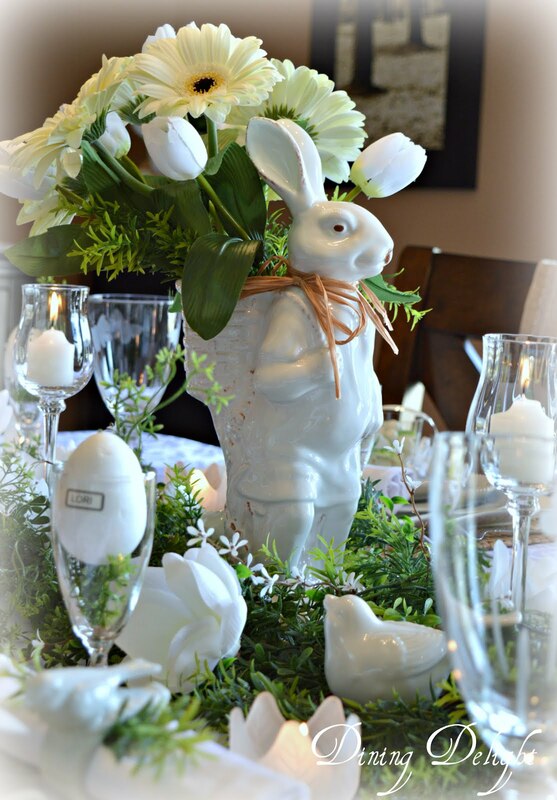 Lori, I always love your tablescapes. This one is just gorgeous! 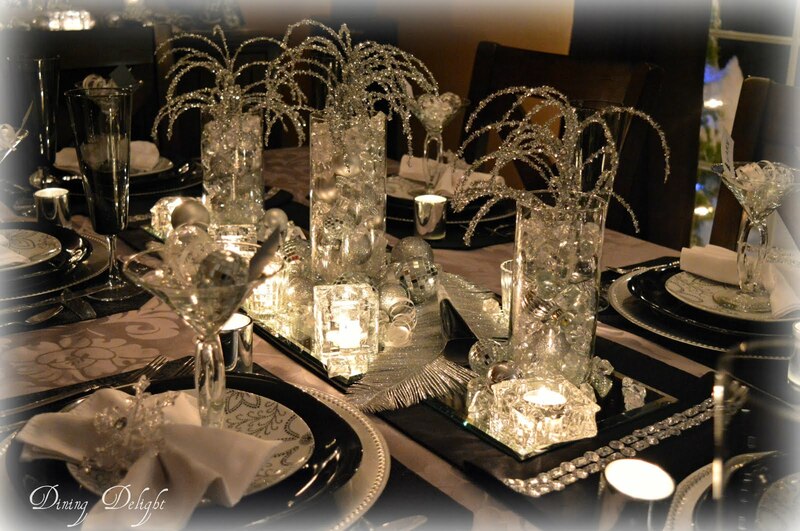 Your candle arrangements are such a beautiful touch to this elegant table. It is always fun blog hopping with you. I hope you enjoy your week! 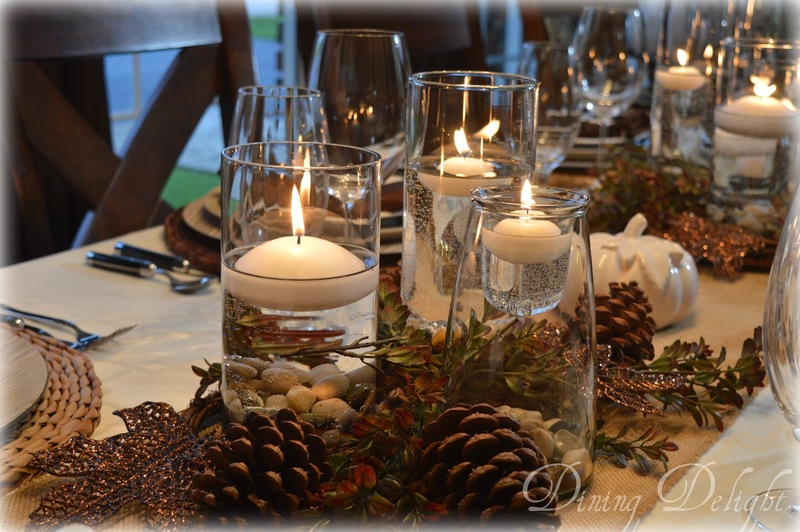 Candles down the table are always my favorite! Thanks for sharing at Home Sweet Home! A mesa ficou linda decorada com maravilhas campestres. Adorei. Felicidades. cumprimentos. This is beautiful. 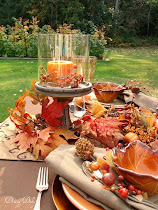 I love the floating candles and all the natural elements in the centerpiece. 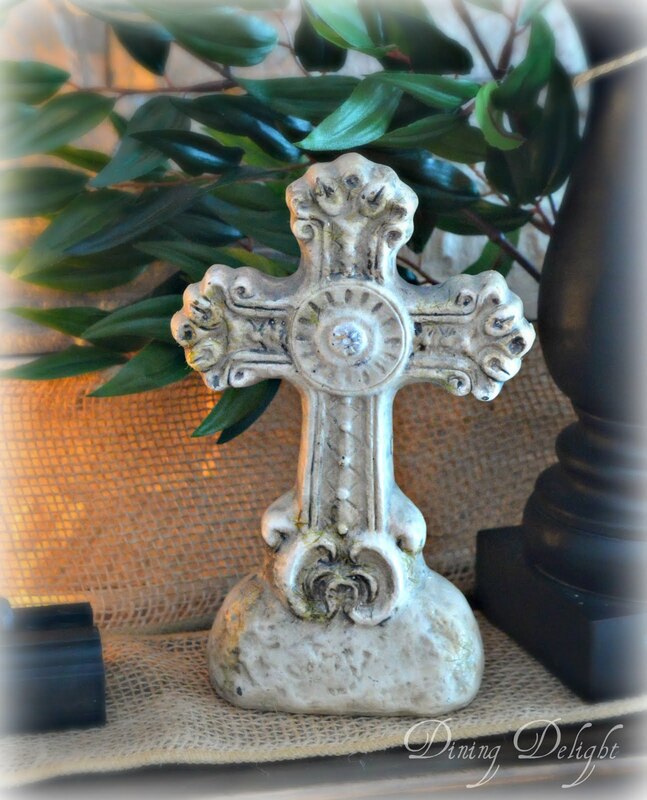 Stopping by from the blog hop. Lori, this is just beautiful! 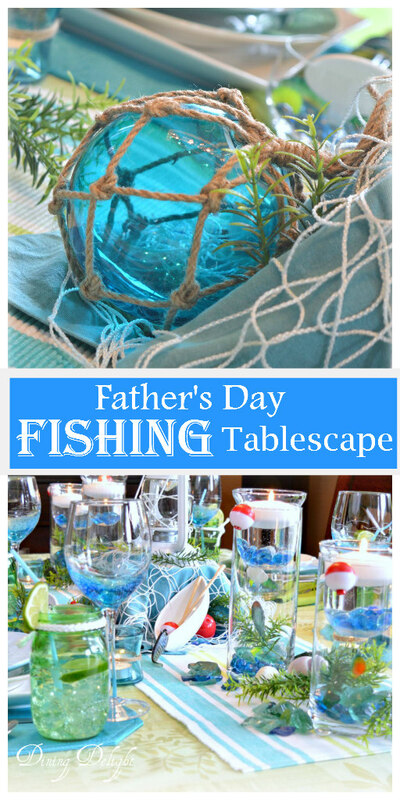 What a gorgeous table you've created. I really like the candles in water--I've never thought of using those in a holiday table setting, but it looks beautiful. Thank you for sharing your creativity. 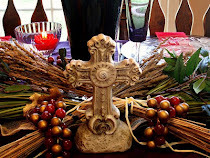 Thanks so much for joining the Grace at Home party at Imparting Grace. 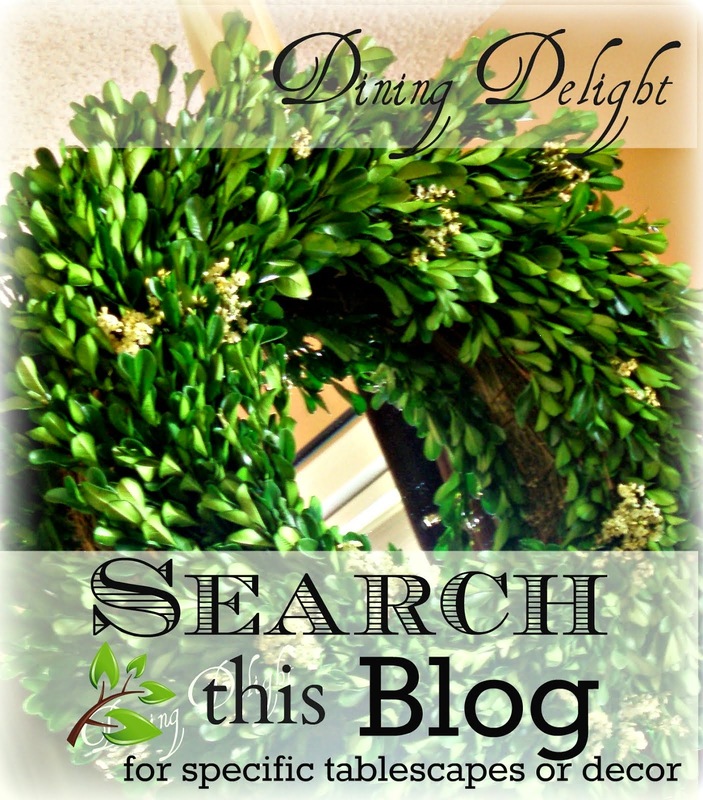 I'm featuring you this week! 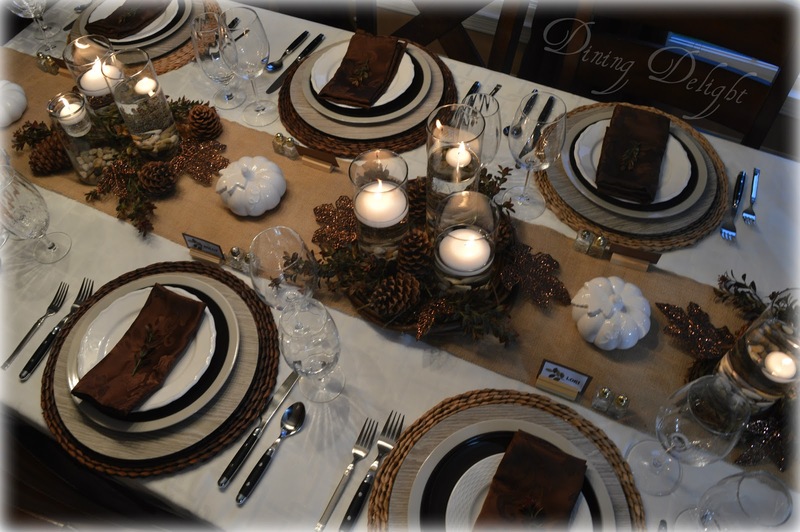 This is such a beautiful and elegant table setting! Thanks for sharing with SYC. Welcome! I'm so happy you stopped by! Have nothing in your home that you do not know to be useful or believe to be beautiful. When your place is comfortable, you are comforted. 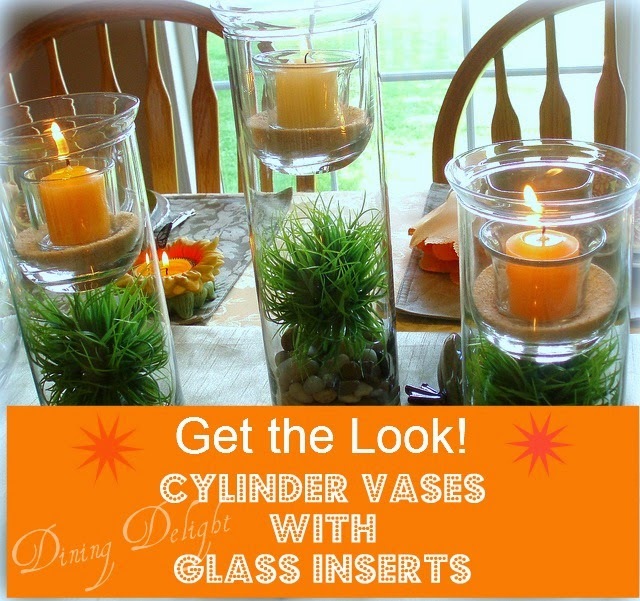 Cylinder Vases with Glass Inserts - Get the Look!